Say Yes to Colour with L'Orèal Casting Crème Gloss + GIVEAWAY!! - Divassence! Lets face it. All of us have had some concerns and issues with respect to hair coloring. And if you are in two minds about coloring then here is something that would make you say Yes to Colour! 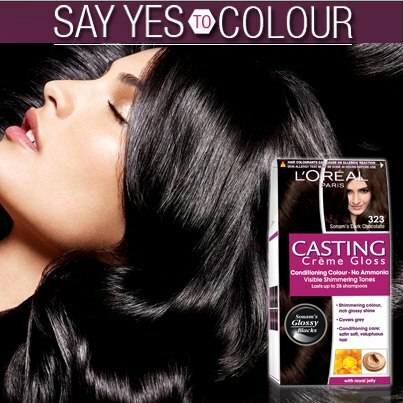 L’Orèal Paris India has launched the ‘Say Yes to Colour’ campaign which talks about the benefits of using their Casting Crème Gloss to color your hair. Curious?? Then here is a chance to win a Casting Crème Gloss of your choice! All you have to do is to fill in the Rafflecopter form below and you are done! You have to be above 18 years of age to enter the Giveaway. This giveaway is open only to the residents of India. The Giveaways starts on the 15th of October and ends on the 28 of October 2012. So what are you waiting for? Go ahead.. Say Yes to Colour! Note: This giveaway is sponsored by L’Orèal Paris India. The hair color of your choice will be sent to the winner by the company. ← Winners of the Divassence! Celebrations Giveaway! Thanks for the lovely giveaway…. Colors recommended for me are : CCG 300 Darkest Brown, CCG 360 Black Cherry, CCG 415 Iced Chocolate. But i would prefer CCG 300 Darkest Brown.